Laurelines: More travel sketches: Bay Area and low country SC. 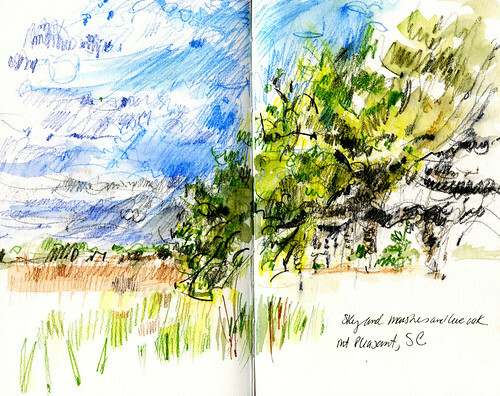 More travel sketches: Bay Area and low country SC. I've had quite the spring. Lots of travel relating to family and friends and some business matters and then, week before last, we hosted a wedding reception in our garden for 120 people! So, blogging was scarce in these parts! And I'm just now recovering from the whirlwind of going and doing. However, I do have some sketches from last week in San Francisco and one from last month in Mt. Pleasant, SC to share. 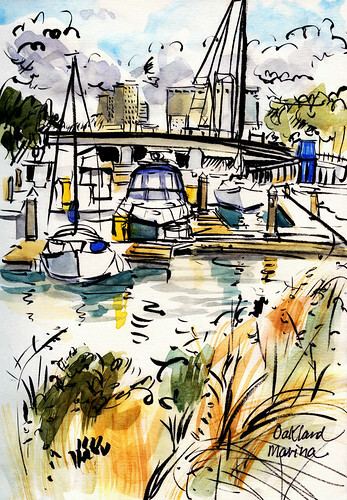 My hotel in Oakland was located right on the bay and there was a nice long public footpath that I took to, with my sketchbook in hand! It was a quiet, soft spring morning and I had fun sketching those blues and yellows in that watery place. 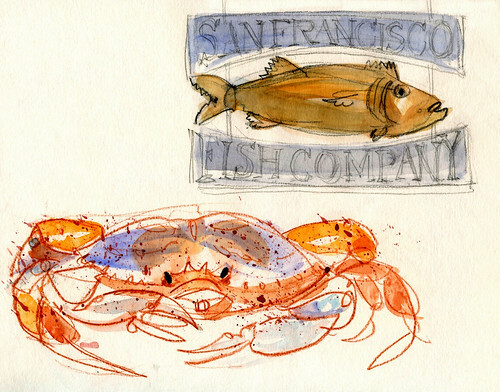 I LOVE to draw and paint crustaceans, so I couldn't resist sketching the crabs in a tank at the San Francisco Fish Shop near the ferry building. Here's one sketch. I have others to share later. 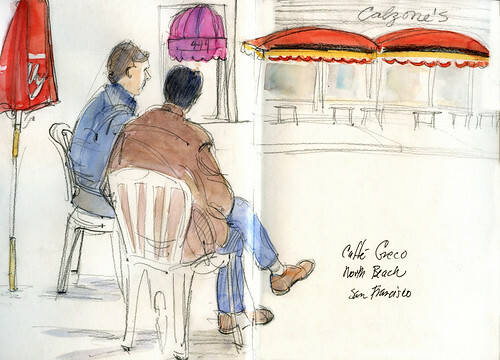 This sketch of two men sitting at a cafe in North Beach shows my more typical San Francisco palette... subdued yet still colorful. 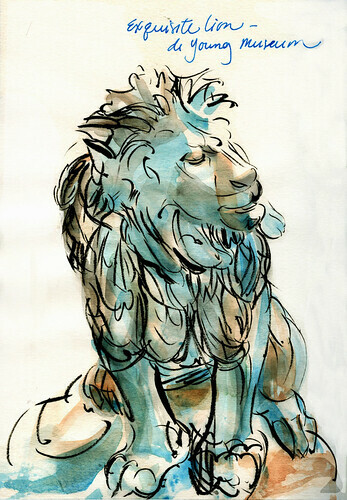 Lions are another favorite drawing subject for me. Marble lions or bronze or anything other than up-close flesh and blood, if you please. This lion sculpture on the grounds of the deYoung Museum had the most exquisite expression on its face, somehow tender and full of longing. Not what you'd expect to find there. 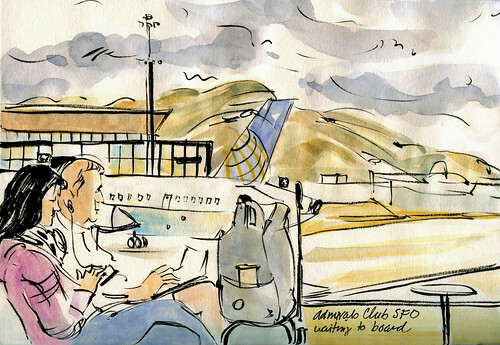 Taking advantage of free models at San Francisco airport, I sketched this couple who were, of course, attached to their devices. Finally, a sketch from our April weekend in Mt. Pleasant, SC, another watery place. I'm going to stay put now for a while and work. I have a fun new illustration deadline looming, my paintings waiting for my attention, and two other projects in the wings. Hope your summer (winter to my southern hemisphere friends) is productive and very, very happy! Sandra, thank you SO much! I marvel at your marbles, if you know what I mean ;D. I'm sure you know the work of the American painter Janet Fish... she is/was a wizard at painting glass and other reflective, shiny surfaces. You would love her, I'm sure, if you don't already know her. Dear Jeff, I love your enthusiasm for my work! And I am grateful that you took the time to comment here. Thank you so much! Thank you, dear Jeffery! Love the shared memories! Oh, that marshland. Bringing back another good memory shared. Someone mentioned the boats picture reminding them of Dufy! Absolutely. And that lion, so alive and whimsical and yet still in full power. Who would have sculpted such a lively beast so that you could capture him poised to speak. I just love your work so much! You perfectly capture the essence of the places you visit in such stylish ways, all uniquely your own!